PALMDALE – In recognition of Breast Cancer Awareness Month, local Panera Bread cafes have teamed up with the Dr. Susan Love Research Foundation to raise awareness and funds for breast cancer research. On Friday (Oct. 18), 100 percent of net sales from the signature Pink Ribbon bagel at local Panera Bread locations will be donated to the Dr. Susan Love Research Foundation and its mission to achieve a future without breast cancer by focusing on prevention and finding the cause. There are two Panera Bread locations in Palmdale (38029 47th Street East & 39403 10th Street West) and one in Lancaster (43458 10th Street West). 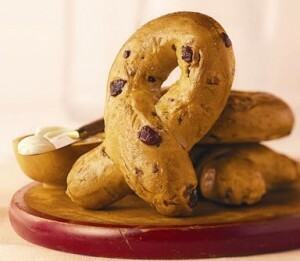 Shaped in the form of the iconic pink ribbon, the bagel features cherry chips, dried cherries, cranberries, vanilla, honey, and brown sugar, and are baked fresh each morning. Over two million Pink Ribbon Bagels were sold nationally in 2012. Throughout the rest of October, 10 cents from each Pink Ribbon Bagel sold will be donated to the Dr. Susan Love Research Foundation. Since its inception in 2001, donations from Pink Ribbon Bagel sales have raised more than $1 million for breast cancer charities. The Pink Ribbon Bagel concept began in 2001 when Sue Stees, co-owner of 18 Panera Bread franchise locations in Oklahoma, and a breast cancer survivor herself, began searching for ways to help other women battling cancer. Her search led her to the kitchen, where she developed the Pink Ribbon Bagel to help raise funds for research. She sold 27,000 bagels in her bakery-cafes that first year. To date, more than seven million Pink Ribbon Bagels have been sold system-wide.